A key strength of any data is that it has been collected in a reliable and valid manner. Without this certainty, player and team statistics can be far less valuable and there would be a danger that different games would be analysed in conflicting ways, rendering proper player & team comparison invalid. To avoid this, we have a long-established a consistent list of ‘Event Definitions’ that are adhered to across all analysts and seasons. Usually at the start of each half, but sometimes needed during the course of a game. The referee throws the ball up to be contested by a player(s) from either team. Throw Up Won: When a player catches the ball cleanly or gains possession of the ball. Kickout: Any time the goal keeper kicks the ball from the ground as a result of the opposition team scoring a goal/point or shooting wide. Won Clean: When a player from the same team as the GK who kicked the ball catches the ball cleanly. Lost Clean: When a player from the opposite team to the GK who kicked the ball catches the ball cleanly. Won Breaking: When any player from the same team as the GK who kicked the ball gains possession, other than catching the ball cleanly. (Usually the result of a scramble, fumble ball hit out of play or contested ball). Lost Breaking: When any player from the opposite team to the GK who kicked the ball gains possession, other than catching the ball cleanly. (Usually the result of a scramble, fumble, ball hit out of play or contested ball). Free For: When a player from the same team as the GK who kicked the ball is fouled while contesting the Kickout. Free Against: When a player from the opposite team as the GK who kicked the ball is fouled while contesting the Kickout. Out of Play: When the GK kicks the ball straight out of play without touching any player from either team. Attack: Any time a player from the attacking team has possession of the ball inside the oppositions 45m line. (2 attacks if dispossessed and won back). (1 Attack if a player enters the 45 passes the ball back out and that team subsequently enter the 45 again). Shot: When a player from the attacking team attempts to shoot the ball at goal, either with their foot, their hand or a flick. No Shot: When the attacking team do not attempt to shoot while inside the attacking 45m line and are dispossessed by the opposition. Kick Pass: Any pass made with the foot that crosses the 45m line. Hand Pass: Any pass made with the hand that crosses the 45m line. Carried: Any attack where the ball is carried by a player over the 45m line into the attacking zone. From Play: Any shot taken during the course of open play (i.e. not from a dead ball situation). From Free: Any shot taken from the result of a free conceded by the opposition team. From a 45: Any shot taken from the result of a 45 being awarded to the attacking team. Penalty: Any shot taken from the penalty spot. Sideline: Any shot taken as a result of the ball going out of play over the sideline. Point: The ball going over the crossbar and between the two posts. Goal: The ball going below the crossbar and between the two posts. Wide: The ball crossing the end-line and not going between the two posts. Save: The Goalkeeper stopping the ball from going between the two posts. Post: The ball striking the post or crossbar and returning to play. (The ball striking the post and going wide would be classed as a wide, the ball striking the post or crossbar and resulting in a point or goal would be deemed as a point or a goal). Blocked: When any player from the opposition team (other than the GK) block the shot from reaching the target or going between the two posts. Turnover: When a player in possession surrenders possession to the opposition. Turnover Outcome: Lost in Tackle, when a player loses possession in a contact situation. Foul Won: Any infringement committed by a player of the team not in possession. Defending 1/3: The area of the pitch between the end line and the teams own 45m line. 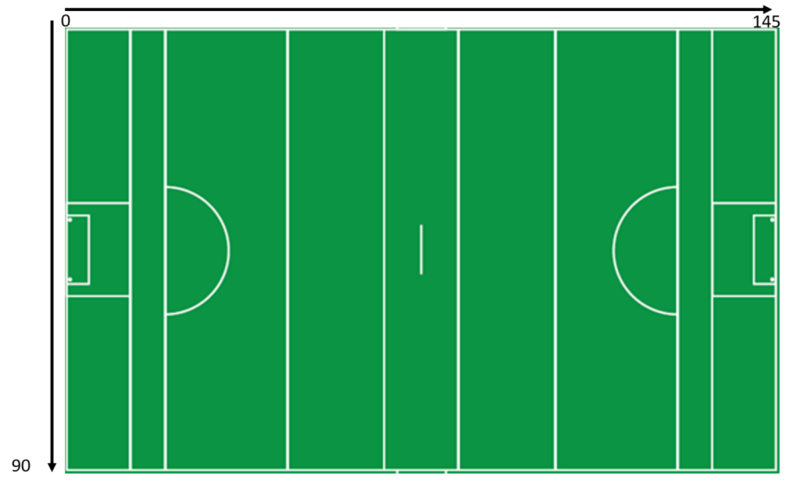 Midfield 1/3: The area of the pitch between the two 45m lines. Attacking 1/3: The area of the pitch between the oppositions 45m line and the end line. The action the referee took after a free was awarded. Pass: Any attempt made by the player in possession to pass the ball to another player of the same team. Foot Pass: Any attempted pass made with the foot. Hand Pass: Any attempted pass made with the hand. Successful: Any pass where the team of the player who made the pass maintain possession. i.e. pass is made to intended player, pass is made to non-intended payer of the same team, the ball is deflected out off an opposition player, the player receiving the ball is fouled. Unsuccessful: Any pass where the team of the player who made the pass does not maintain possession. i.e. pass is intercepted, pass goes directly out of play. Each event is marked with an X & Y co-ordinate. The pitch has 145 ‘zones’ from goal-line to goal-line and 90 ‘zones’ from touchline to touchline. This in effect gives us over 13,000 individual zones.